On 12th June 2014, I did what only six year old Angela thought I would do; I completed my first year of teaching. Though, I don’t think six year old Angela thought that she would be teaching half way across the world. I did it though. And not only did I complete one year of teaching at one place, but, a week and a half later, I completed my first year teaching at another place as well. Yes, you read correctly. I taught five days a week at my main school and I would also teach on Saturdays. I’ll get back to that later though. It was definitely an experience filled with things I expected and things that I did not expect. As much as I absolutely loved my children (and still do), they beyond wore me out. Let’s get something out of the way here. In America, or in England, when one thinks of a private school automatically strict rules and discipline come to mind, right? Well, not here. A private school here, especially the one that I was teaching at which was a conservative (religious) private school is kind of the opposite. In these schools, the kids (or rather their parents) rule the school. The private schools in this country, for the most part, are nothing but businesses. They advertise and promote constantly creating a false sense of, “Wow! This school is amazing! My child will learn so much!” When, in reality, it’s not so much like that. There is a high turnover rate for teachers; especially for the English teachers. Everyone gets paid very little for the amount of work that they do, especially the Turkish teachers who not only work late every night, but who also must come in on the weekends as well. Aside from the fact that the turnover rate is high, these “schools” are also fairly new which means that they aren’t quite set in their ways. There are no set curriculums or curriculums that work. These are chain schools that could do really well if they focused on the actual education of these students and not when and where they’re going to open up a new school. If they focused their time, energy, and money on a school (and with the amount of money these schools have) the kids would flourish. The children that I taught have so much potential and I hope that it does not go to waste. Aside from all of this, the children are spoiled, never corrected or disciplined, and are free to essentially do whatever they please. In the beginning of the year, I was very close to quitting to be honest. The teachers who are there, though mostly lovely and nice women, don’t know how to handle children how they should. I don’t think they know the proper psychology behind everything and will constantly yell at the children (or certain children that annoy them) and call them names. Apparently though, that is the way that things are done here. When it came time for English class, though, they expected every lesson to be a strict lesson where we drilled English into their heads, but fun at the same time, and not boring, and make the children listen like little angels at the same time. Well, it took me almost half a year to corral the children and have it so they would actually sit down and listen in class. Being that they’re kindergarteners though, I knew that they also need fun time and play time or they get antsy and won’t listen. Why did it take this long? Well, in this school, like I said earlier, the children win. The English teachers are never or are rarely shown any respect by the other teachers or even the teacher assistants for that matter, so the children mimic that behavior. The children are also spoiled brats and we’re essentially not allowed to discipline them. This means that even if a child hits another child or throws toys or a temper tantrum that nothing really happens. There’s never a phone call home about it because then the parents would complain and yell at the teachers or the school because nothing is ever their little angels’ fault. So, yes, it took over half a year of different methods and straining and grief to finally get these children to listen. Three-quarters of the year passed and we then had the huge problem where most of the English department was let go and all of our lessons were switched around. I no longer had my shared five year old class and I no longer had my 6D class. Instead, I had 6A and 6C, which had reputations for making the teachers gray-haired. I tried my best though. Remember how long it took to get my other two classes to behave semi-normally and make them teachable? Well, I had half the time to try and do this. At first, they were ok, because, hey new teacher. But then, things became ugly. 6A was split between me and another teacher. They tended to listen to her more because she’s a bit more strict in her manners of teaching (not to mention she’s Turkish so she better at handling them) and I was just the teacher that they could walk all over some classes and other classes, if they felt like it, they’d listen and things would go smoothly. One of the main problems with that class though was that the room was too big. It was hard to get the children to focus in there. 6C was an interesting class. This is the class with the worst reputation. In the beginning, they listened. They knew practically no English whatsoever, but they listened. I was starting to wonder why they were the class that had such a bad reputation. But then, it hit me, and it hit me hard. This class will not listen to a lick of what is said if their homeroom teacher is unable to teach and the longer she is out (and she was out for like two weeks due to meetings and organizing things) the worse the class becomes. They just had a complete disregard for any authority figure (even the assistant teachers had had enough of this class and sat there in a state of utter defeat). So, I would try to teach every time, and I would fail every time. The only thing that seemed to work with this class was busywork. So, I had to have an endless supply of worksheets for these children. When I did, they’d do their work and listen…mostly. It felt like I was at the beginning of the year again with these two classes. And it didn’t get better because, as it was the end of the year, the classes were constantly interrupted for field trips, shows, or practices of some sort. So, there was no real schedule anymore. The children and the teachers all caught the end of the year fever. And then, just as quickly as it began…it finished. It was a sandwich of a year; crazy, hair pulling bread and smooth happiness for the inside. I know I made a lot of progress with the children though. I am not the kind of teacher who drills phrases into the kids’ heads. I know that the children’s parents want to hear them speak, but they’re not at the age where they need to be learning phrases. They’re at the age that they just need to soak in as much English as they can. The drenched them in vocabulary and by the end of the year, some of them were starting to put things together on their own. Even half way through the year, I was getting some of them to have conversations. Albeit very one-sided conversations, they were understanding the things that I was saying and trying to respond with a few words and lots of gestures. It was harder with my weekend children to get to this point though as they only had English lessons once a week. Finally, towards the end of the year, they were starting to understand some things and become more confident. The only problem I had with these children was the age differences. I had children from four to seven in this class. This meant that I had kids who could read and write and others who still can’t write numbers. It was a challenge, but three quarters of the year later I started teaching them all the English alphabet and the phonetics that went with it. It made for some more interesting classes and the children really seemed to like learning about it. Big numbers and the alphabet seemed to be a hit in that class. All in all, it was one hell of a year. I taught and I fought and I taught some more. As much as these children drove me nuts, I love them all. There’s something special and unforgettable about your first students. They and the memories that I made with them will last a lifetime. I wish that I could check up on all of them in ten, fifteen, twenty years and see where life takes them, but only time will tell. This year is finished and new adventures await! Since my last update, there has been a lot that’s happened here. Due to the problems involving my school and the government there have been many unfavorable changes at my school and many others. Because of these problems way too many of our beloved teachers had to leave. We are all trying to wrap our heads around this surreal situation. One day they were here teaching with us, the next they weren’t even allowed to come to the school. Even though we are all still trying to figure this stuff out, fewer teachers means an obvious change in our schedules. Out of the five English kindergarten teachers there are only two of the original including myself and a third who used to be a coordinator. Actually, if you think about it, I am the only original left since the other girl has only been working with us in January. Aside from that, our schedules have been completely switched around. I used to teach 6B, 6D, and have a shared class with 5C. Now, I don’t have my 5 year olds at all, and I have lost 6D. I have added on 6A and 6C. These two classes are drastically different from what I’ve had to teach all year. Keep in mind that 6B and 6D have only had me as their English teacher all year. For 6A and 6C I am their fourth English teacher. They both have severe behavioral problems (6C being the one that is going to give me white hair). I have to go into those classes prepared for the worst, and I never know how I am going to come out. I know all of their names, and the kids somewhat know me, but they’re not used to behaving. For the most part, I have gotten 6B and 6D to behave and respect me. 6A and 6C don’t really know what that is. Luckily, I still have 6B who I’ve always considered my angel class. It is interesting noticing the differences in the dynamics of the classes and even how much English the class as a whole knows. Basic stuff that 6B and 6D know, these classes have no clue about. I used to be able to have conversations with 6B and 6D, but I can’t at all with these two classes. So, I am essentially starting from the beginning with these two classes as their fourth English teacher at the end of the year. One thing that boosted my teaching esteem was when the teacher who now has 6D told me that she loves them because they know so much English. That made me smile. And to think that I used to consider 6D my devil class! They don’t even compare to the new ones I have. I will try to do my best with these classes. I do want them to know what the other classes know, and there are a select few students in each class that really do want to learn and know a decent amount of English. The sad part, though, is that even these students who are smart and want to learn don’t listen that well simply because they haven’t had a stable teaching environment throughout the year. Well, I will have an interesting month and a half left with them. Let’s see what I can do even though the month of May and certainly June are known as the all fun and no work months in the school world. I’ve been noticing some things about my children. For one, they’ve certainly aged over the two week winter break. It’s bittersweet. I don’t want them to grow up! I was skimming through some pictures I have of them from the beginning of the year and the ones from now, and the changes may not be noticeable to someone who doesn’t know them, but to me? Wow! They’re losing their baby fat, becoming more like little adults…It is strange to watch them grow up. During lunch the other day, some of the “big kids” came over to say hi to their brothers/sisters and some of the teachers. They looked so grownup even though they were probably only ten years old at most. A bunch of them hugged one of our English teachers because they had had her just three years ago. Then I started thinking about my little ones and how much they are going to change in just a couple of years. I confess, I did get a little teary eyed. I’ve also noticed that some of them are really starting to understand more. They may have forgotten some vocabulary over winter break, but, in general, they are starting to understand more of what I am saying. For example, the other day we were playing Pictionary with the SmartBoard to review our animals. Whoever guessed the animal got to come to the board to draw. 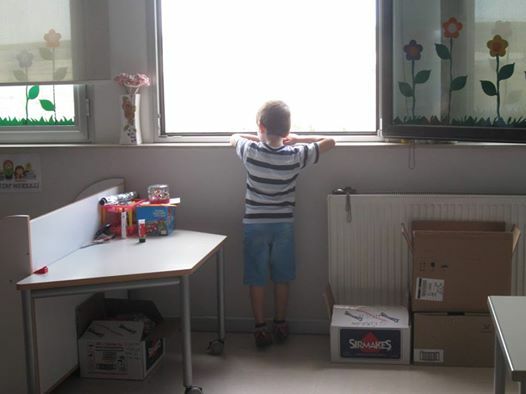 One of my children had already had his turn at the board, so I looked at him and said (with gestures as well) that he had already gone so if he could pick someone else to go instead it would be really nice. At first I didn’t know if he had understood because some of the other students had distracted me, but less than a minute later I felt a tug at my sleeve. He told me to, “Come,” and then proceeded to whisper into my ear the name of the child that he had picked to go instead of him! I was so proud of him. Not only did he understand, but he also was not selfish about keeping his turn. As much as some of these children can drive me crazy, they also melt my heart everyday. The other day, when it was time to go home, the children would not let me leave. The circled around me, each one grabbing onto and hugging a different part of me. “Teacher, no goodbye!” Then one of my little cherub faces held my hand an wouldn’t let go until he was distracted. This has been happening a lot more lately. I certainly don’t mind it. It makes my day for sure. If there is one thing that I love about teaching in Turkey, it’s that unlike in the States, the children are allowed to hug and kiss you and you can reciprocate the actions as well. No one will call you out for it saying that you shouldn’t do that. In fact, it’s encouraged. Love, love, love and more love. Speaking of love and noticing, I’ve found my nurturing personality to have really come in handy. My one student, who had been transferred from another school because his behavior was so bad and violent and been making improvements; well, at least he has in my classes. I decided that when he came, what he did not need was another person yelling at him. He needed and needs someone to give him a little extra attention and love. I can be firm with him, but I will not yell at him because I honestly believe that’s the only way he has ever heard his name. He’s obviously a hyperactive child who needs a different kind of care than the other children. This is something that the other Turkish teachers do not seem to realize. I constantly hear him getting yelled at or I see him sitting in the hall while the other children are playing in the play room. Now, yes, sometimes his actions do necessitate a consequence, but I also have noticed that a lot of the time he is unfairly blamed for things or they yell at him because even though there are other children out of their seats, he’s the problem child so they’ll automatically yell at him. I’ve seen this happen in my own class (the assistant teachers are sometimes in our classes during our lessons). I made sure at the end of that lesson to point out to the teacher that he had been good and that there was no need for punishment of any kind. It may take more than once, but eventually, he’ll listen to me. He’s no longer violent in my classes and, in fact, has started to randomly hug me. I can tell it’s not something that he is used to doing because of the way he does it, but it’s a start. Sometimes, in order to do his work, he also needs a little push. I’ll sit down next to him and start working on the project with him or I’ll tell him what needs to be done. More often than not, he’ll end up doing the work. He just needs some extra motivation. Author Una VagabondaPosted on 16 February, 14 16 February, 14 Categories UncategorizedTags bilingual, children, efl, esl, foreign language, grow up, growing up, hugs, kids, kindergarten, kisses, language acquisition, motivation, noticing, nurture, preschool, problem children, school, second language, speaking, Türkiye, teacher, teaching, tefl, turkce, Turkey, Turkish2 Comments on Noticing. These past few weeks have been going really well at the school. I know I’m going to jinx myself by saying this though. For the most part the children have been very cooperative, and even…dare I say… somewhat respectful. They’ve also started to randomly run up to me in the hall, or shout, “Angela Teacher! Angela Teacher!” every time they see me and will not stop until I acknowledge and/or talk to them. I love them so much. I cannot describe to you how it makes me feel. Unless you teach children, I don’t think you’d be able to understand. The closest similar situation I can think of would be being tackled by a bunch of puppies. In a way, I feel it’s even more special because of the language barrier that there is. I can tell they’re learning more and more every day. Break through! 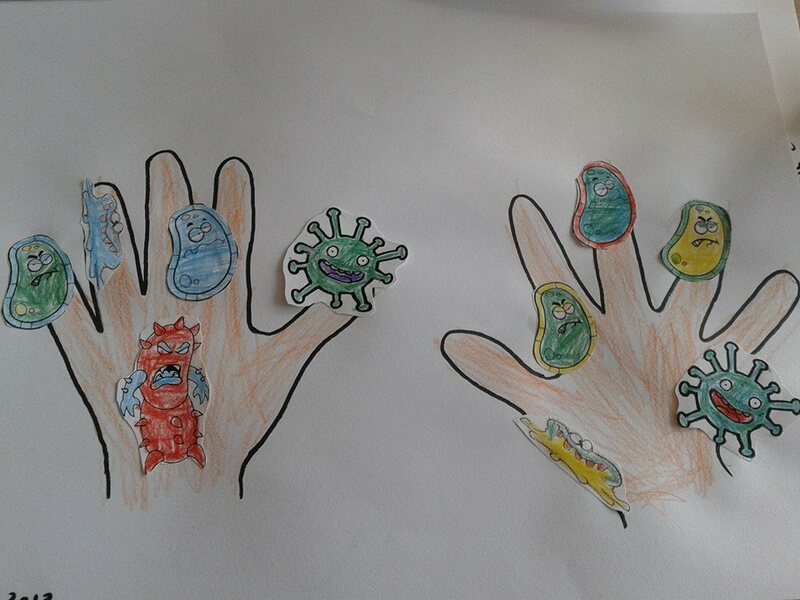 This week we were learning about germs and hygiene, and I thought to myself that this might be a bit difficult to do, but to my surprise, it’s gone over really well! The first day we started talking about it, I played a short video with a lot of English, but they seemed to get the general idea. They even kept going on about it in the little English that they knew. They were all very eager to try and say stuff. There was a lot of miming going on. And I found myself having conversations with them. Now imagine these little phrases with the most adorable accents. This week went pretty well. We did some crafts to go along with the germs and hygiene. 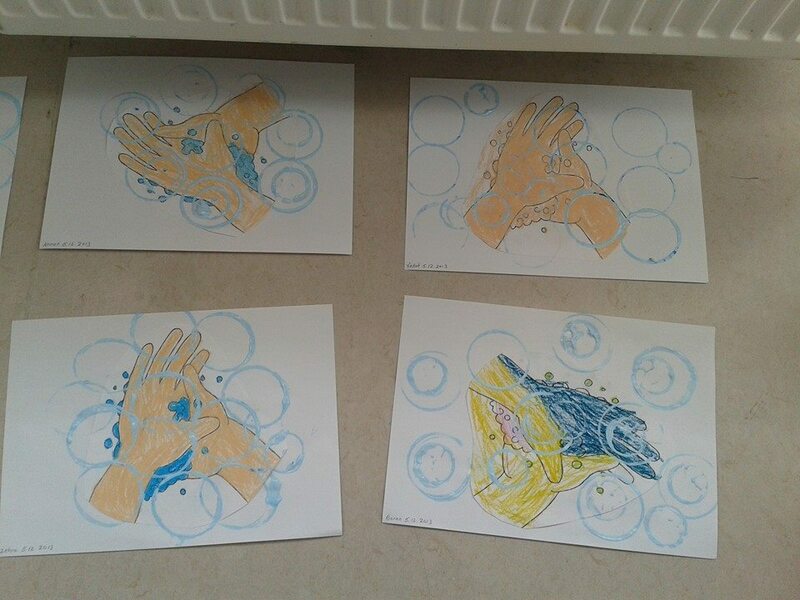 Germy hands, followed by wash your hands, and finished up with sparkling clean hands. Also, I started Turkish lessons about a month ago (they’re only once a week), and I and his family can already see huge improvements in my understanding of the language. The Turkish teachers at school can see it as well. It’s hard, but I’m trying. I wish I had lessons everyday, but this once a week is better than nothing. Having actual instruction is the only way for my brain to learn the language, because that’s how my brain has been hard wired. It’s a pain, but living in a house where only Turkish is spoken helps (and at the same time can be super stressful). I really just need to start memorizing more vocabulary. I cannot wait until we start learning more about sentence structure and verb conjugations. I’ll try to update more regularly! I’ve just been really busy as of late. The big thing though right now is that my students haven’t been stressing me out as much as they used to, and I love it and them. They’re all way too cute for their own good. Author Una VagabondaPosted on 6 December, 13 Categories UncategorizedTags bubbles, children, crafts, cute, efl, English, esl, hygiene, ingilizce, kids, kindergarten, language, learning, preschool, student, Türkiye, teacher, teaching, travel, turkce, Turkey, TurkishLeave a comment on So much love! A few weeks ago we had an interesting day and experience for us new kindergarten teachers. We had been told by our agency (not the school) that essentially we are all horrible teachers and are on the verge of being fired; not only did they tell us this, but they said it in a very nasty way. Because of our “horrible” performances, they decided that Unnamed Teacher from the agency needed to come in and show us how to teach the proper way. Now, I must add that in our training sessions we were told that we should pretty much forget everything that the agency told us to do in the classes because it was wrong. She came in yesterday morning, carrying herself, as usual, with her humungous ego and arrogant, nasty, condescending way of speaking. She jumped in on my lesson first. Well, let me tell you I was not happy at all with the way that things unfolded. Not only did she completely ruin my lesson plans for the day, but the way she treated the children was unacceptable to say the least. I know that I do not have experience in teaching and that at times the children make me want to pull my hair out, but I do know that scaring a child into submission is wrong. 1. She had all the students come out in the hall at the beginning of the lesson and line-up. Of course she did this very sternly, much too stern for these children. In order to reenter the classroom they all had to say their name. If they did not cooperate, they were sent to the back of the line and not allowed to enter the room until they did as they were told. She was also very handsy with the children; she would physically move the child to the back of the line or block the child from entering the room. 2. Once in the room she then made all the children sit down. Sounds ok, right? Not quite. Again she was physical with the children. If the child did not have his or her feet on the ground, she would grab their feet and put them on the ground. If a child was not sitting or wouldn’t sit down, she’d wrangle them, pick them up and put them in the chair. She was in no way gentle with the children. 3. Certain aspects were ok and doable such as high fiving the children who were sitting the right way, and doing emotions according to how they feeling (making faces for happy, sad, etc…). 4. After she was done (which was half way through my lesson), she looked at me, “Ok, what do you have planned for today?” I responded that we now didn’t have time for everything that I had had originally planned. So we did a partial lesson. 5. One of the misbehaving children was to hand out the books (which is a good point: make the unruly child have a job to do). The books had a video that they could follow along to since the children cannot read. As I was playing the video, she made me pause the short video every few seconds and have the children say what the new animal was that was introduced and what sound it makes. This is something that we had previously been told not to do unless the video had been watched before. It’d be the same as if you were trying to watch a show and someone kept pausing it and asking you questions. It breaks your concentration and angers you; it’s unfair to the children. If the video had been played again then perhaps it would had been more acceptable to do. 6. After the lesson, one of the children collected the books for me. We then went on to do an animal PowerPoint that I had prepared for the children. Since we’re learning about families and the book that they’re learning from has the adult and baby versions of the animals (cow / calf, cat / kitten…etc). Since the book does cover the pig, the children do learn it but extra time is not to be spent on it. For those of you who are unaware, the school that I am at is slightly conservative, and in the Islamic religion pigs are dirty, filthy animals and these children are taught that from the very beginning. So if a child goes home making pig sounds or faces, the parents are absolutely horrified by it and will and have called the school about it. When it came time to do the pig on the PowerPoint I mentioned this to Unnamed Teacher (and since she’s been in Turkey for awhile she is well aware of this) and we normally just quickly skim over the pig / piglet and move on to the next animal. She then blatantly said that she did not care and that they were doing the pig and the pig sounds. 7. After this, the lesson had ended and we were running into break time. Again she did not care and stated that there had to be an actual end to the class. I told her that I normally had the children do “The Goodbye Song” if there was time, which normally there is time but since we had gone into break time already, and I was going to be in the same classroom after break we should all be allowed to take their break. She wasn’t happy with this. During the break the children are normally allowed to go drink water, go to the bathroom, and so on. But Unnamed Teacher wanted this to be changed as well. She made them all line up again single file and head out to the bathrooms to wash their hands. She then proceeded to smell all of their hands to make sure they washed with soap and if they didn’t she sent them back into the bathroom. They were then all lined up to go back to the room, but before the went into the room they had to say something in English. If they didn’t they weren’t allowed in the room and had to go to the back of the line and sit. Finally, once all the students were back in the room break time was over and none of us (the kids and myself) didn’t even get an actual break. 8. She said she wanted to know how I ran the class and for me to start the lesson. When I went to start the lesson though, she stopped me and had all the kids to stretches. Stretches aren’t bad to do and the kids enjoyed that. The thing that annoyed me was that she was completely took over the lesson and even though she said she wanted to see how I ran the class, she kept taking over before I could have a chance to. The children kept looking at her like she was an alien. 9. We then went over the Animal PowerPoint again that I had made that had the animals from the Farmyard Jamboree on it (cow/calf, cat/kitten…etc), along with the animal sounds. That went over fine, but, again, she wanted to spend more time on the pig/piglet than I felt was necessary. 10. 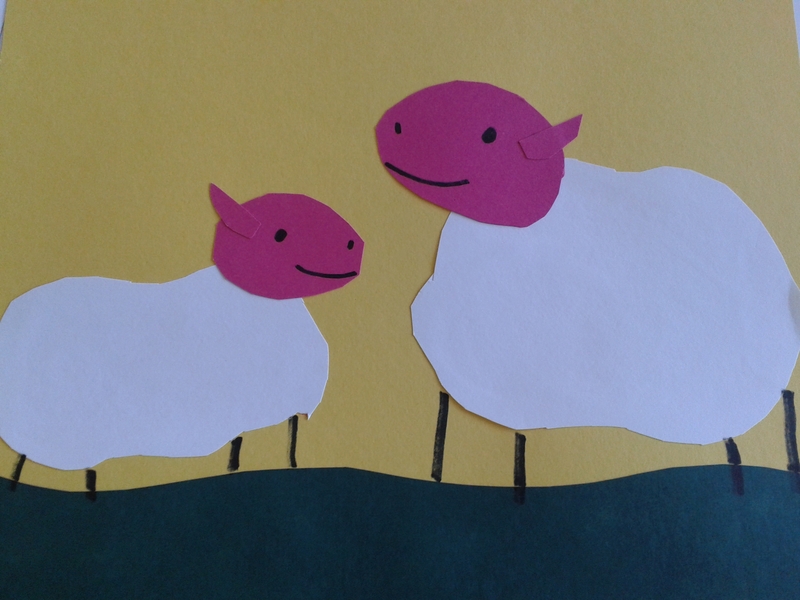 We then moved on to the activity that I had planned out for the day which was a cut and paste sheep/lamb activity. She kept criticizing how I was talking to the students as well. The kids understand me when I tell them to get up and get their pencil cases. They know what I mean, I call that a success. In her opinion, I spoke to quickly. I wasn’t. I was speaking at a normal pace, which is what we had been told and taught to do in the training session at the beginning of the year since when children interact with a native English speaker or watch an English show they’re not going to speak ridiculously slowly like Unnamed did. When she spoke that slowly the kids kept giving her weird looks, then look back over at me as if they were asking me what in the world was wrong with this woman. As the students one-by-one were finishing their projects, they were cleaning up and putting away their pencil cases which is very good and what they have been taught to do. Unnamed didn’t think that this was good enough. Even though the students have been told and taught to clean up their mess and put their stuff away when they’re finished, she wanted them to each raise their hands and ask permission each time they got out of their seats. Ok, so this doesn’t sound like a bad thing, but when there are ten students who all need to get out of their seats to throw something out or to put something away every two seconds and you’re trying to help other students with things, it just doesn’t make sense, especially when they’ve been taught to clean up and whatnot all on their own. Unnamed physically sat them back down and raised their hands. My one shy and sensitive little boy had finished his stuff and packed up his pencil case. He went to get up and put it away when Unnamed yelled at him to sit down and ask permission. He obviously didn’t understand, and just sat back down and started crying. When I went to comfort him, she was like, “No, move on to the next child.” I was about to flip out. It got the point of being ridiculous. 11. The other two English teachers were called out of their lessons to watch this lesson as well so they were sitting on the side. Some of the students were moving around at this point so she had one of the other English teachers try to make them sit down. Now, keep in mind that this isn’t the other English teacher’s class, so the students don’t know her and she doesn’t know the students. She told them to “Sit down, please,” but they didn’t listen I guess. Unnamed got annoyed at this and was like, “No, you’re not asking them to sit down. Don’t say please. Tell them. Be stern. Be loud.” She then had her essentially angrily yell at the students to sit down. I felt so bad the kids and the other English teacher at this point. I was talking to the children and Unnamed comes up to me saying that she likes that I was now more involved with the children and that’s how I should always be. By this point, I had to refrain from cursing her out and instead snippily said, “Well, I normally am a lot more involved with the children but it’s hard to do so when you’re here and take over the class.” At the moment though it was time for lunch so she was cut off from whatever she was going to say back to me. We all rushed down to lunch to avoid her. When I went back to the classroom later on that day, the kids and even the Turkish teacher assistant were happy and relieved that Unnamed wasn’t there. They all thought she was nuts. I wasn’t surprised to hear the next day (and I was actually a bit happy) that parents had called the teachers that night complaining and asking about who this horrible woman was that made their children cry (she had gone into other classrooms as well). She may know some useful things, but when it comes to kindergarten, and especially kindergarten in Turkey, I think she should stay far, far away from it. As of late, my children have been listening better and I think it mainly has to do with the fact that they’re starting to fall into the school routine. I haven’t had many problems with the students, and if I do, I simply tell the homeroom Turkish teacher after the lesson. The next time I’m in the classroom they behave much better. I’m think I’m starting to grow on them as well, and I think the students are starting to realize that they’re picking up more English than they thought. I may not be all fun and games all the time but I know when they need a break. I’ll turn anything into an English lesson. Even musical chairs. You play English music and say simple commands: “Sit!” “Walk” etc. My job may be stressful, but I love it and my children.